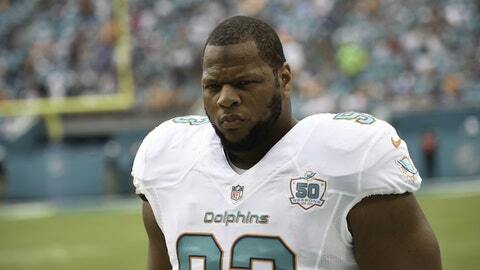 Did Ndamukong Suh kick Ryan Fitzpatrick in the head? Ndamukong Suh faced scrutiny after another questionable play. Questions are being asked once again of Ndamukong Suh after he seemed to kick Jets quarterback Ryan Fitzpatrick’s helmet off during Sunday’s game in London. Suh was in pursuit of Fitzpatrick, who was making a run to the sideline. With Fitzpatrick down on the ground, Suh ran toward him, but his left leg caught Fitzpatrick in the head, knocking his helmet clean off. You be the judge of whether it was intentional or incidental. Suh’s reputation precedes him and it’s very easy to see why this is being looked at as more than an inadvertent collision. He was already accused of kicking an opponent in the head this season, which you can see here. The pulling back of the left foot is definitely a red flag, and there was definitely some force behind it as well. Some will argue that Suh was just trying to avoid tripping over Fitzpatrick, but if that’s the case, why the kicking motion? Expect to see this video analyzed and dissected for days to come, and we’ll see what the NFL offices think of it.